The Question – What the H**l Happened Down There? Me at the CDP General Session on Sunday! What the hell was going on down there? That was actually the question. “Down there” is Sacramento, California, and yes, it was wild! The upheaval within the Democratic Party came home to California this past weekend. The deep discontent that I saw simmering just below the surface at the CDP Convention last summer in San Jose blew up the house in Sacramento. And it seems the party leadership never saw it coming. So when it happened, they had no idea how to deal with it. So, why all the fuss? What the hell happened down there? So what happened (from my view) is that the delegates had a clear choice between (a) someone relatively new to the party and (b) someone who had waited years for “his turn.” A choice between (a) an outsider with a track record of recruiting and training women to successfully run for office and (b) the ultimate insider who presides over a party chapter with a history of exceptionally low voter turnout. It was a clear choice between (a) someone who managed to unify Berniecrats and Hillary supporters, and (b) someone who will have a very difficult time gaining the trust and support of new people who came alive in the party because of Bernie Sanders. An obvious choice between (a) an energetic smiling young Black woman and (b) a somewhat “entitled” middle-aged gay man. Their positions remind me a lot of the contest Barack Obama and Hillary Clinton in 2008. I know some people want to make Kimberly “an angry Black woman.” And some perceive Eric as “your mean older brother.” Their personalities was not the deal-breaker for me, anymore than their age, race or sexual identity. Make no mistake. 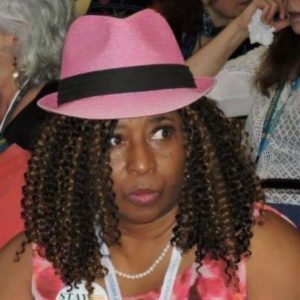 I supported Kimberly Ellis for Chair. What mattered most to me were two things: (a) who had the best vision for the future of the Democratic Party; and (b) who had conflicts of interest that might impact his ability to advocate for the needs of everyday people. Kimberly’s message about redefining what it means to be a Democrat was inspiring, particularly in light of the party’s failures for at least the past two decades. Fortunately, the contest was not simply a case of “identity politics.” It is well known that many Black politicians do not support Kimberly. Most notably the Chair of the CDP African-American Caucus. I know gay men who did not support Eric. Still, it troubles me that Black women have the highest voter turn-out as Democrats (meaning we are the backbone of the Democratic Party), yet, we do not have a single Black woman in charge of a statewide Democratic Party. Not here, not there, not now, not ever. This is a big problem for the Democratic Party. Who Turned Off the Mike on Auntie Maxine? Then there was the insulting treatment of senior political matriarch, Congresswoman Maxine Waters. On Saturday night, as Kimberly’s candidacy was going down in flames, a young white man decided to interrupt Maxine Waters’ speech. In full view of the African-American Caucus. He was completely un-intimidated. He stepped up to the Congresswoman and told her to stop talking. She just happened to be giving her bad report on No. 45. And talking bad about No. 45 “for real.” It seems that the young man could not take it. So he just walked up and interrupted her. When she would not stop talking, he turned off her mike. What really scares me is that if he wanted to harm her, he could have. Maxine Waters is an America icon. She is currently serving her 13th term in Congress. She was elected in 1990. 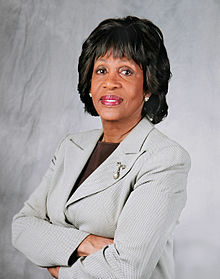 Congresswoman Waters has served on the Democratic National Committee (DNC) since 1980. She was a key leader in five presidential campaigns: Sen. Edward Kennedy (1980), Rev. Jesse Jackson (1984 & 1988), and President Bill Clinton (1992 & 1996). Before she went to Congress, she spent 14 years in the California State Assembly. In the California Assembly, “Auntie Maxine” as she is fondly called, served as the Democratic Caucus Chair and is credited with pushing some of the boldest legislation California has ever seen. She lead the fight for divestment of state pension funds from South Africa. 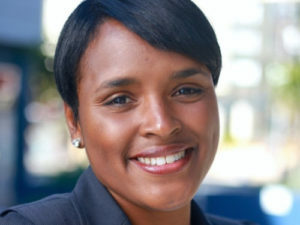 She authored landmark affirmative action legislation; the nation’s first statewide Child Abuse Prevention Training Program; the prohibition of police strip searches for nonviolent misdemeanors; and the introduction of the nation’s first plant closure law. The way that this man boldly stepped up and interrupted Auntie Maxine was absolutely shocking. I seriously doubt that he would have stepped to Congressman Paul Ryan or Congressman Kevin McCarthy in such a way. Certainly, he would not have turned off the mike while either one of those Congressmen was still speaking. The entire African-American Caucus is outraged by such blatant disrespect. Even those of us who were not there. The video is quite alarming! So, one of Eric Bauman’s first tests on accountability to the party is how he responds to the complaint lodged by the African-American Caucus. Mr. Bauman not only has to address the outrage of Kimberly’s supporters (who booed him from the floor on Sunday and then walked out), but also the outrage of those who have love and respect for Auntie Maxine. Mr. Bauman needs to get busy right away! Otherwise, he may never gain the credibility he needs to lead us in the fight against Trump!